Marmoleum or Linoleum is tough and natural, crafted from natural resins, wood flour, pine extracts and linseed oil. It comes in a wide variety of colours and styles. Available as a tile or on the roll, real lino (not vinyl) is one of the most beautiful, hard wearing and practical hard floors - ideal for kitchen, bathroom, working or livingrooms. Rubber flooring is lovely to walk on, look at and is extremely hard wearing and practical. 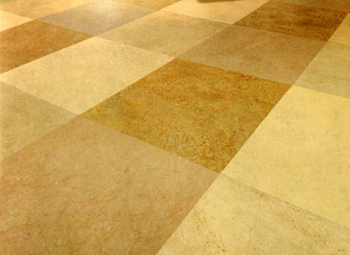 Completely smooth or with many texture styles and a huge range of colours. Bamboo can be fitted as tongue and groove boards or woven strips that can be made into amazing rugs. Paper flooring creates a very sophisticated and unique flooring or rug, its made from strips of paper twisted together to make yarn and then woven into very clean styles. Waveney or Medieval matting is made from English rush fibres woven together to make stunning and rustic rugs, the like of which have been used for centuries.